well then solar power would be OP because if night never happened than whats the point of having any other way to generate power? Ehm, solar and batteries should scale accordingly i think. If you decide to skip days, solar power is pretty useless, but batteries will still be useful as you can charge them from a furnace generator. Likewise; if you skip nights; batteries still makes sense for non-anchored techs. Solar power is already OP. But so what? Even if this were possible in SMP (which doesn't exist yet) you'd have the option of playing on a different server. If you prefer to play with long nights or shorter days to make solar less OP you'd have that option. Personally I don't see how it could be an issue to you if you don't like an optional feature that could make the game better for others. 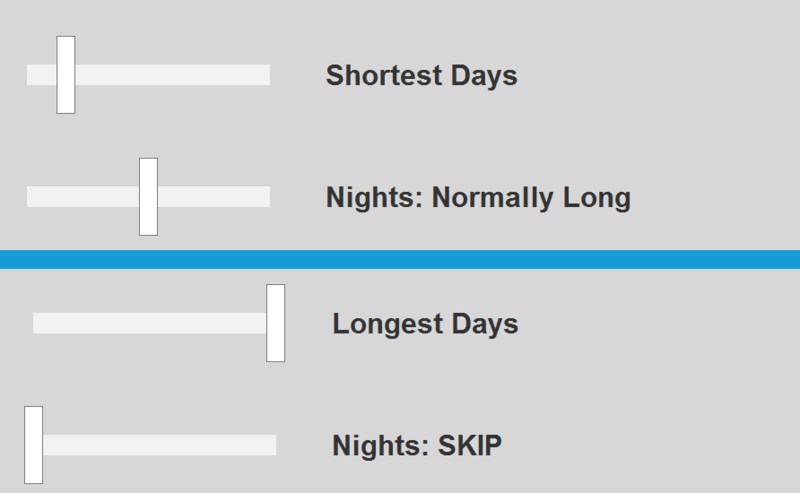 I like the idea, though I think the length of nights are fine as they are I'd like days to be way longer than they are now (3x as long). I would like to make this day shorter so weekend comes sooner. if you skip nights; batteries still makes sense for non-anchored techs. note to self: don't post stuff when tired.